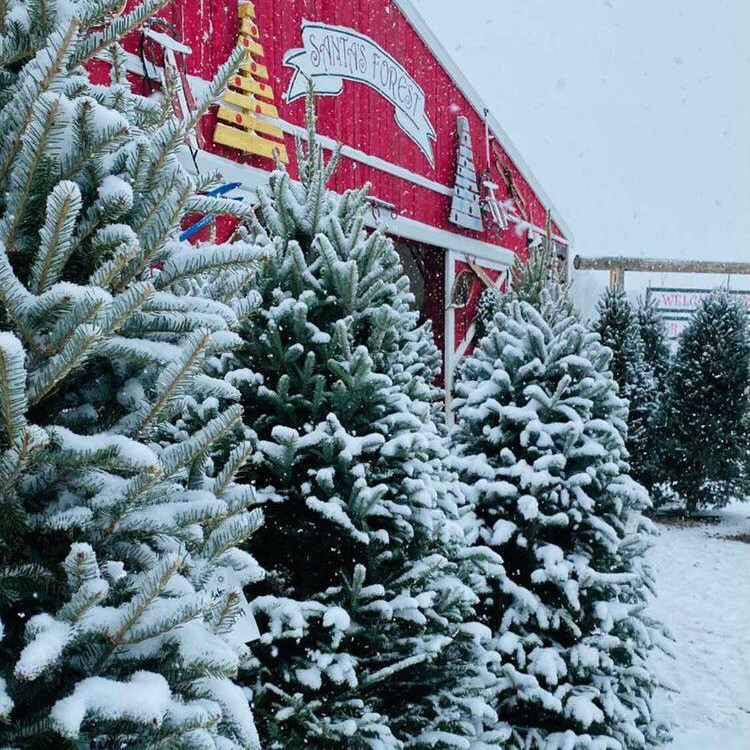 Benjamin Tree Farm grows over 25,000 trees for your choose and cut tradition. We have over 30 acres planted in Christmas trees and 20 acres for nursery stock. Our Christmas tree species are mainly white spruce and balsam fir however you will also be able to find a few white pine and some blue spruce throughout our fields. Our trees range from seedlings to trees 8' tall. We also have a large pre-cut selection of premium Balsam Fir and Fraser Fir. These trees are individually displayed and priced in Santa's Forest, a large enclosed 40' x 80' hoop building. For this year's harvest/cut your own we have 5 price ranges. The white spruce is the only Christmas tree native to Ontario and has generally been considered the traditional Christmas tree to many. The foliage is short pointed needles that are green to blue-green and the tree has a sweet evergreen aroma. It takes 8-12 years from seed to harvest with annual trimming required to keep the perfect shape. On the farm we plant 2000 annually as survival rates are very high. An introduced species that is native to the south-eastern United States, foliage is similar to balsam fir except the needles are darker green with silvery lines beneath. This species has a very pleasing appearance as a Christmas tree with excellent needle retention. Some plantations have recently been established in Southern Ontario and these trees grow relatively slowly. 12-14 years is required for a Fraser fir to become a quality Christmas tree. The Colorado Blue spruce is a truly beautiful tree which is now in greater demand for Christmas. It has adapted well to Ontario's climate, but grows more slowly than the White Spruce. It takes approximately 10-14 years from seed to produce a Christmas tree. Needle colour ranges from dark green to powdery blue with needles that are 1" long and very prickly. Needle retention is better than other spruce and branches are very stiff. The Balsam fir is a popular tree, with 50% of our customers choosing this species over all others. The Balsam fir regenerates naturally in Nova Scotia and New Brunswick, however; in Ontario seedlings must be purchased and planted. The tops of its needles are dark green and shiny while the underside are a silver-blue colour. The tree has a natural pyramid-like shape with evenly spaced branches. The needles are quite soft and the tree is easy to decorate. The aromatic scent of the Balsam brings natural Christmas wonder into the home. This is the last tree stand you will ever need! It accommodates any size trunk or crooked trunk. The adjustable rope mechanism makes set-up a breeze. The red metal bowl holds 32, 8 ounce cups of water for extra large water capacity. A metal 36" base will hold trees up to 9 feet. These tree stands are available for purchase in the gift shop for $79.99. Benjamin Tree Farm now manufactures a larger tree stand with an upgraded heavy duty metal bowl. These stands utilize our same time proven rope tensioning system and have a stronger and wider base of 42". These stands provide support for trees up to 12' in height. They are available for $139.99 in our gift shop. We also offer plastic tree stands for $29.99. Benjamin Tree Farm can supply and deliver larger cathederal trees. Please contact us for more information. Potted trees from 18" to 60" will be available. These trees can be planted immediately or used on porches and decks as decorations. These potted trees can also be brought indoors for a short period of time to be used as your real Christmas Tree.